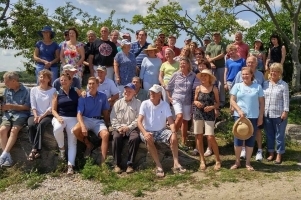 Some Classmates gather at Weed Beach during our 50th Reunion. for organizing a great weekend. If you are already listed on the website, please go the "Classmates" menu at left to update. If you are signing up for the first time, you will find instructions after clicking on the "Classmates" menu at left. If your e-mail address has changed you can sign-up again or use "Contact Us" button if you need help or to reset a new e-mail address. Also... check your junk mail for messages from MyEvent.com that hosts our website. In addition, if you want to join the Darien High School Class of 1967 "private group" page on facebook, contact Sharon Duffield on facebook. Forward our website link to everyone you know in the class of 1967. Photo Albums: There are several photo albums on the site. Anyone can submit reunion or other photos. Please name people when you submit pictures. Use the "Guest Book" page for anything you want to share with the class. Please sign-up and encourage classmates to sign-up. It is the easiest way to get reunion information out to everyone. WE ARE HOPING ON ALL OF YOU WILL HELP FIND PEOPLE AND TELL THEM ABOUT OUR OFFICIAL WEB SITE!